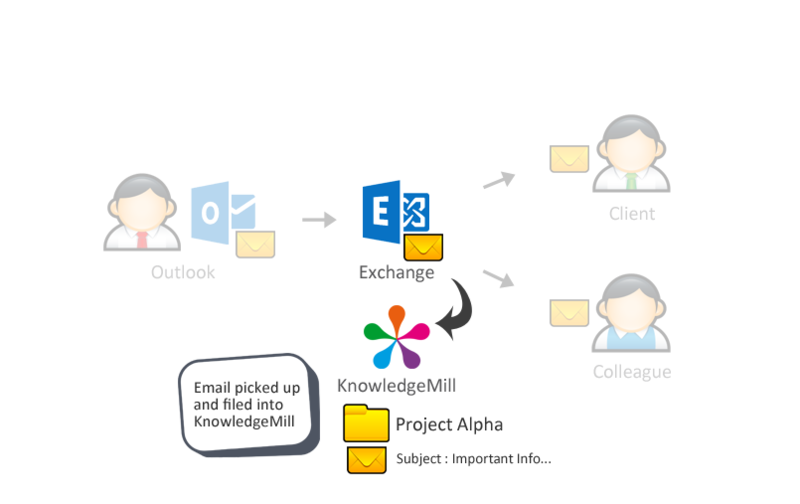 Knowledgemill works alongside your existing Microsoft Exchange email system. Your Exchange service might be running on your own servers, hosted by a 3rd party IT provider, or perhaps running in the cloud with Microsoft Office 365. We’re compatible with all of them. 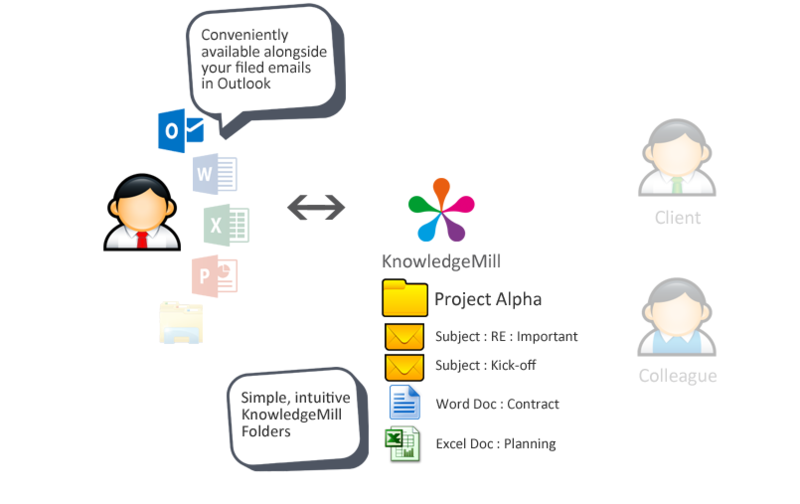 A key advantage of Knowledgemill is that the main user interface is delivered through Microsoft Outlook. There’s no need to enforce a cultural change in your business in order to collaborate more efficiently and to become more productive. 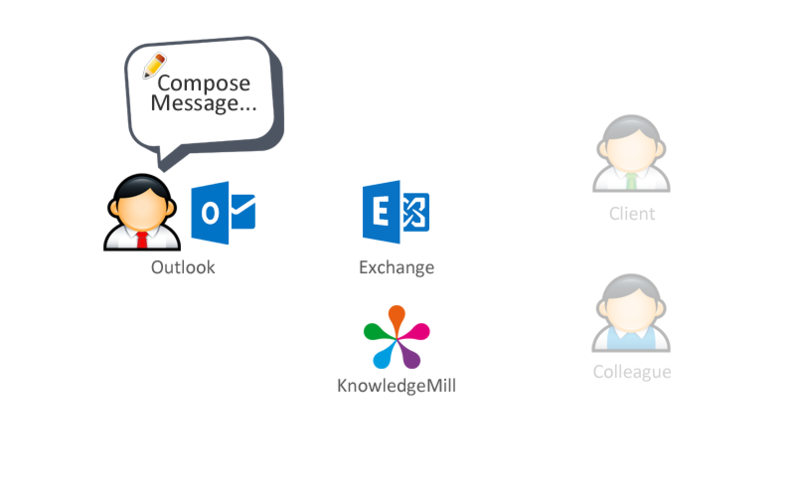 It’s a natural extension to Outlook and users can be up and running sharing emails and documents within minutes. It just feels natural. 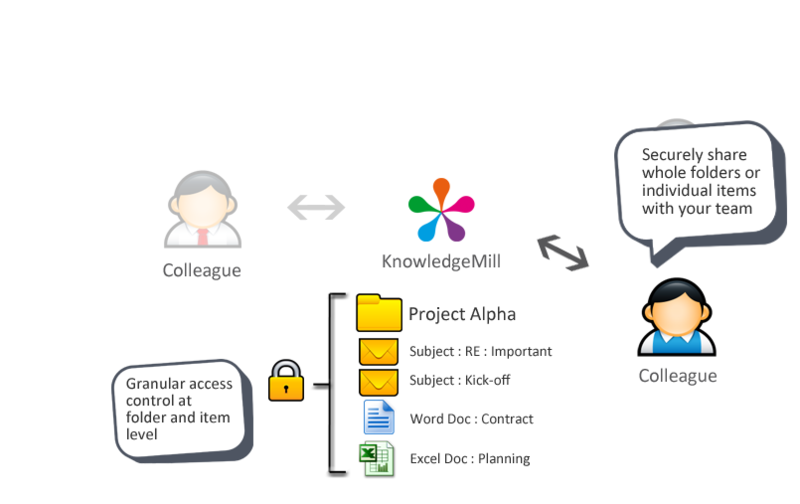 When a user sends or receives a new email, Knowledgemill asks the user where they would like to file the email to. 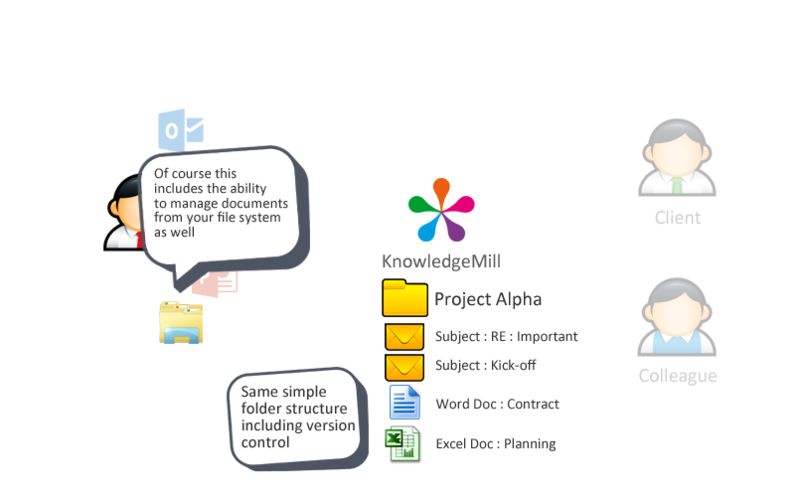 Knowledgemill will suggest where the email should be filed to, but ultimately the user is empowered to be able to make the choice. 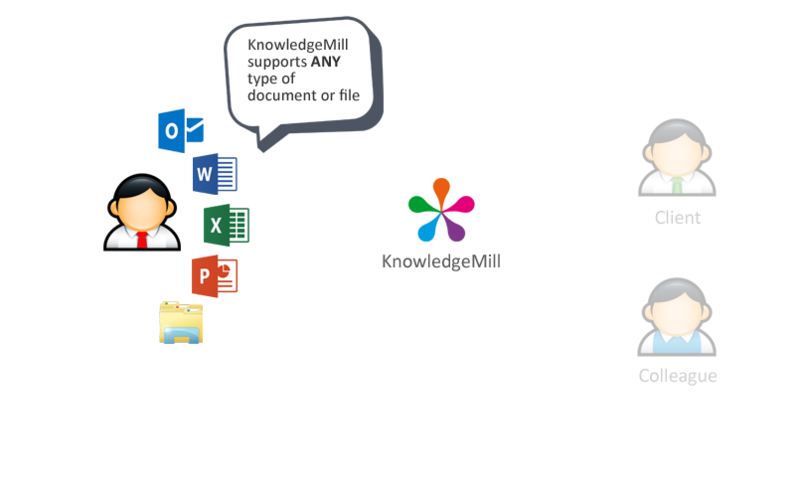 Replies and forwards to existing emails are automatically filed by Knowledgemill. The user does not have to think about it. It just works. Of course, at any point in a conversation the user has the choice to change where the email is filed to, or to file it to more than location. The really clever part is that the filing process happens in the background. Emails are simply flagged for filing through Outlook. 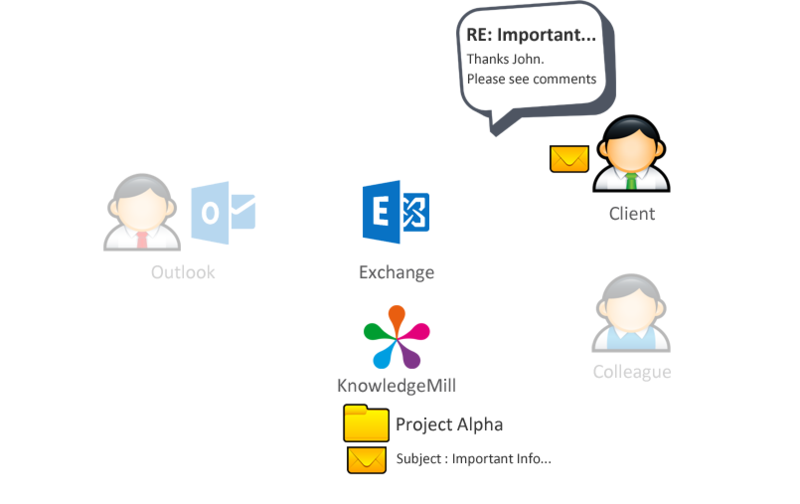 On the server-side, Knowledgemill locates the emails in the mailbox and then files them securely. This keeps Outlook free from any kind of load and allows you to get on with your day job. Emails and documents are intrinsically linked. 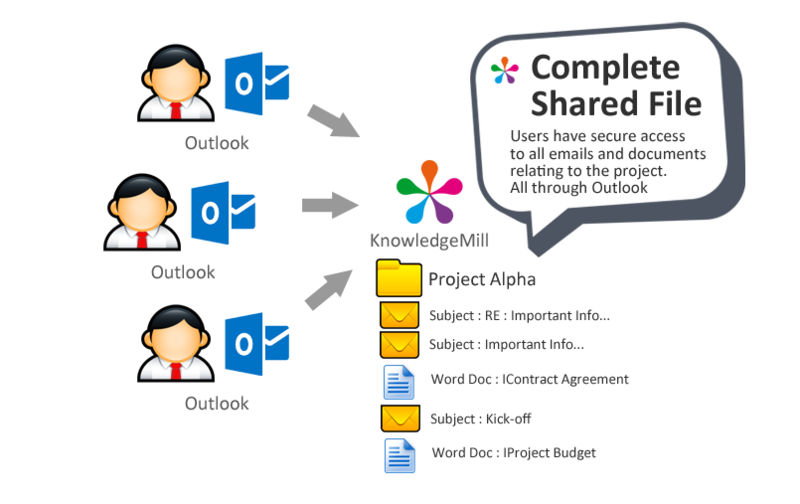 This is why Knowledgemill enables you to store, manage, and share documents through exactly the same user interface in Outlook. 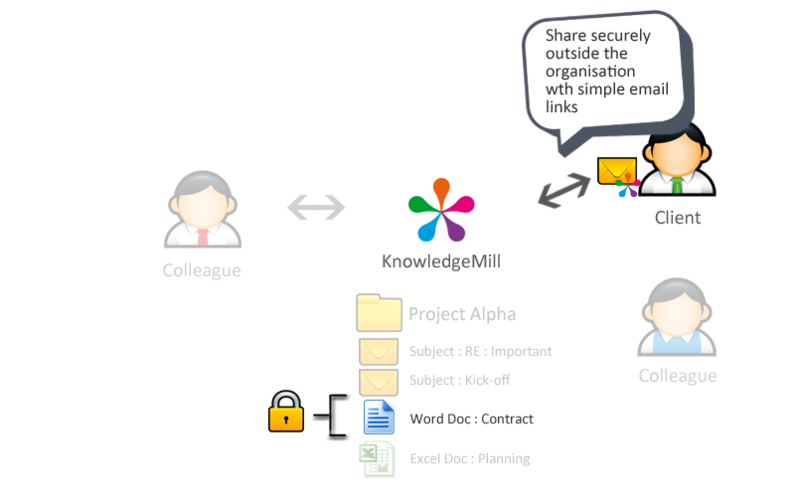 Quickly attach or send links for these documents to your colleagues or customers directly from within your email. It’s like attaching a file from your desktop, but the links are secure and locked down. No need to learn a new tool. 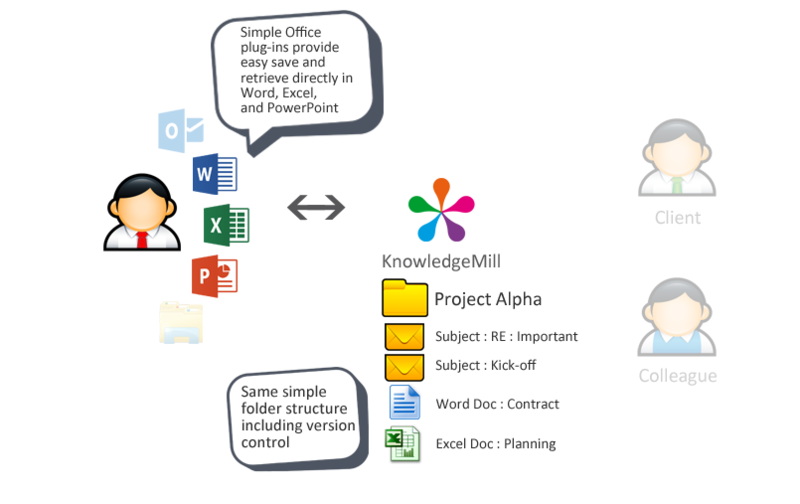 You can put any kind of file or document into Knowledgemill and we also provide a set of really easy to install Microsoft Office plug-ins so you can quickly open, save, and version control directly from within Word, Excel and PowerPoint. Just like Microsoft Exchange, you have the choice of running Knowledgemill in the cloud or on your own servers. We keep our pricing model simple so that they are both the same. The choice is yours. We do recommend the Cloud Service because you get the most benefit. Optimal performance, 24/7 monitoring, dedicated service levels, generous storage for long-term growth, elastic scale, and the highest levels of security. 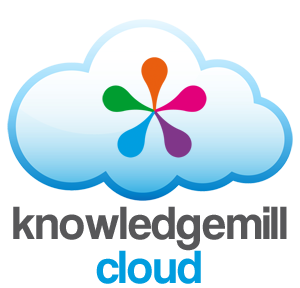 Your Knowledgemill service is available instantly. We also recognise that some businesses are governed by rules which mean they must keep their data within their own walls. 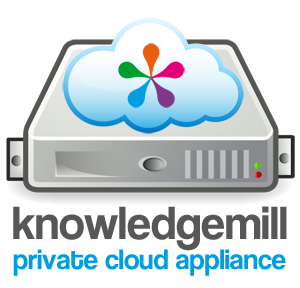 The Private Cloud Appliance is a virtual appliance that you can upload onto your own virtual servers. We support both Microsoft Hyper-V and VMWare ESX. You simply turn the appliance on, allocate storage, and away you go. It’s quick and easy to do this yourself or, of course, our engineers will do this for you. It’s part of the setup process. The Private Cloud Appliance is self-managing. It’s like having your own Software-as-a-Service running from your own servers. It intelligently uses the resources it’s provided with and pro-actively sends our support team and your IT team email alerts should there be any problems. 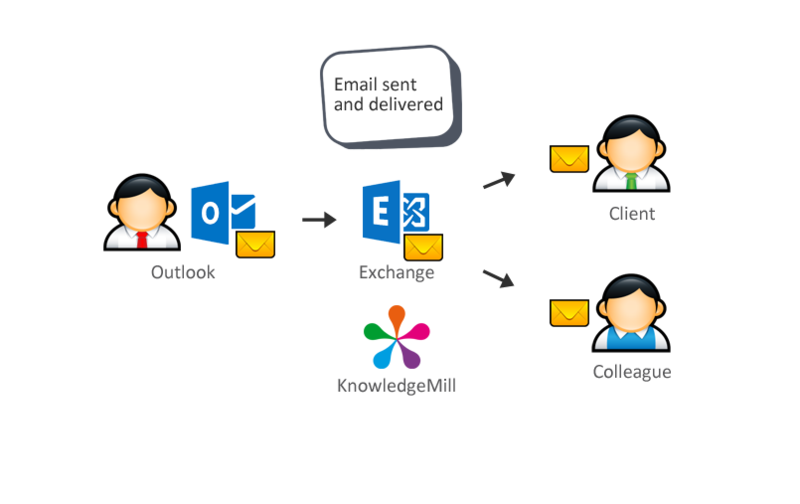 With both approaches, Knowledgemill talks to Microsoft Exchange using the Exchange Web Services (EWS) API. 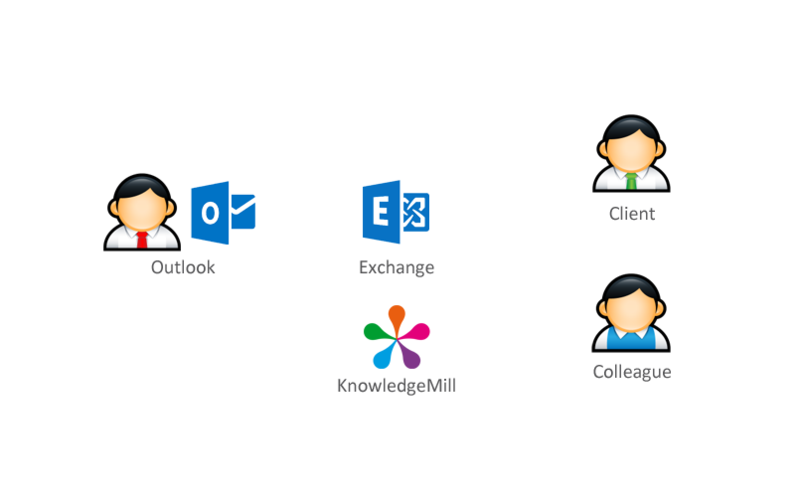 EWS is the standard approach recommended by Microsoft for integrating with Exchangeand means that we can talk to your email service whether it is running on-premise, with a 3rd party provider or Office 365. Our connector uses a service account with the appropriate permissions. The set up only take a few minutes. Optionally, you can also integrate with your Microsoft Active Directory. 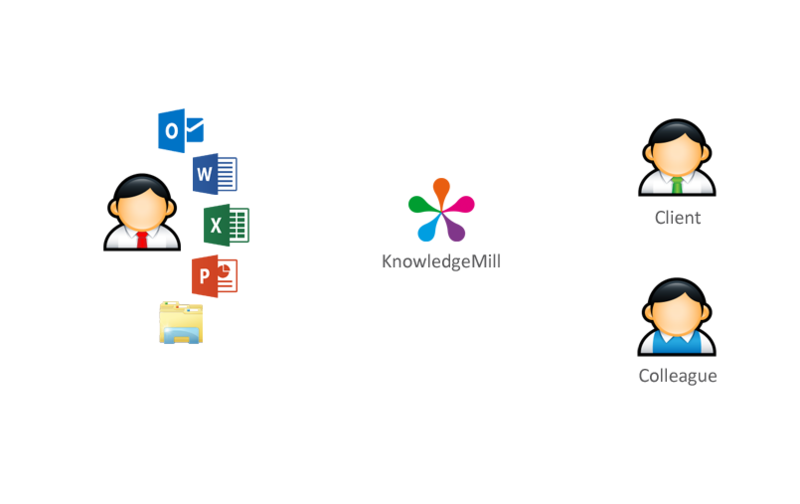 This allows for the automatic provisioning of users and groups into Knowledgemill and also allows Active Directory to handle all authentication instead of Knowledgemill itself. What do I need to get going? The basic requirement is that you must be using Microsoft Exchange, either on-premise, hosted, or as part of Office 365. In terms of the detail, we have the following minimum requirements.